Medialooks, creators of professional video software development API MFormats and broadcast television production and playout automation API MPlatform, have integrated support for NewTek NDI® into their MFormats Professional and Expert level products, and thus into MPlatform. MFormats is geared to allow developers to access and handle video-with-audio on a random access basis within their applications, accurate to the individual frame. MPlatform provides higher level functionality that allows broadcast clients and production developers to develop applications for ingest, virtual studio, video switcher, CG, playout and other broadcast use cases. NewTek has provided NDI as an open source SDK to allow both developers and producers in broadcast and video production a way into IP workflow based on current and common Gigabit Ethernet network infrastructure. With NDI, the users of these commercial SDKs now have full integration of the IP workflow solution that offers video transport over IP across all levels of broadcast and video production on 1 Gigabit Ethernet networks. Integrating NDI also creates a bridge to and between the “SDI-over-IP” solutions requiring 10 Gigabit Ethernet and higher, currently in development for high-end broadcast needs. The strength of IP workflow is that the technology is designed to allow for interoperation of multiple protocols, so users may adopt any of these solutions that they need to fit specific use cases within their production pipeline. User choices are not limited to just one and to the capabilities that one may support. 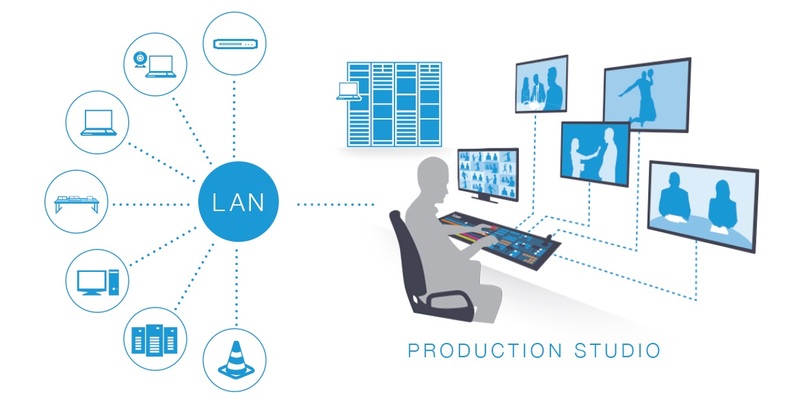 NDI is able to be a bridging technology within such a multi-standard IP workflow because it maintains pristine video quality when the video must be transported between other pipeline segments via 1 Gigabit Ethernet.